Mexico is one of the most diverse, beautiful and culturally magnificent countries in the world. Its sheer size means that you have many different terrains, weather systems, foods, cultures and even languages, in one amazingly vibrant country. In the north of Mexico alone, you have tropical jungle, cosmopolitan cities, deserts, small tribal areas and very interesting fusion foods. Head to the centre of the country, and you have Mexico city, some of the most breathtaking forested areas in the world, Mayan Ruins, huge lakes, and traditional colonial towns. The south of Mexico is all about the laid back lifestyle. Here you have the Riviera Maya, one of the top holiday destinations in the world, beautiful beaches, lush jungle, cenotes, manglar forests, and a heavy dose of Mayan culture. There are around 108,700,900 people living in Mexico, with 19,231,800 of them living in and around Mexico City alone. This population brings in an amazing mix of culinary expertise, history, cultural diversity and artisanal brilliance. El Chico is a sleepy little town, located only 40 minutes from the busy city of Pachuca. 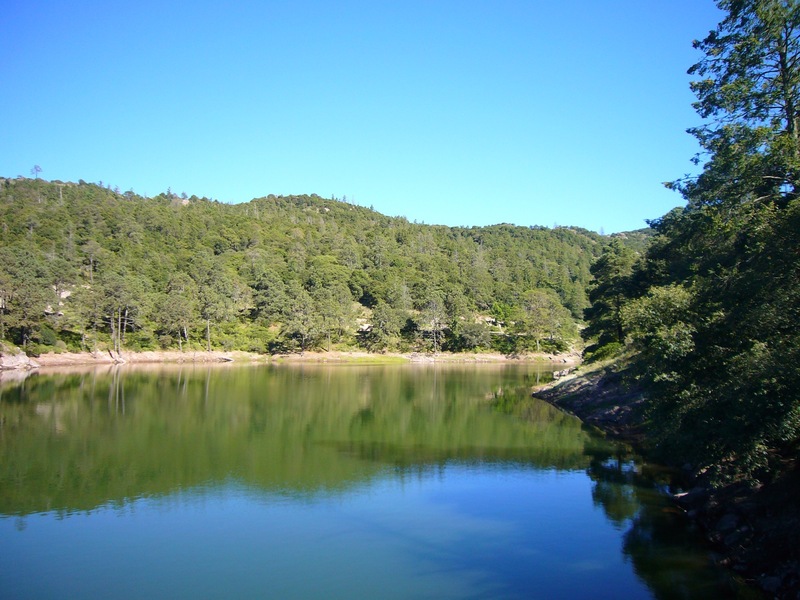 Surrounded by thick forest, rugged mountains and glistening lakes, El Chico is an outdoor lovers dream. Whether you’re a hiker, waterfall chaser, mountain biker, horse rider, sailer, or just want to get back in touch with nature, then El Chico is the perfect spot for you. The Prismas Basálticos are a magical natural phenomenon found in Santa Maria Regla. These mysterious rock formations have miraculously been formed by the stunning cascade of water that rushes over them each day. Basaltic prisms can only be found in 4 places in the world, but the biggest are the Prismas Basálticos in Mexico. The stunning green surroundings, gigantic waterfalls and darling little stalls in at the Prismas Basálticos are definitely worth exploring. Gran Cenote, Tulum. Photo credit: Simon Evans. 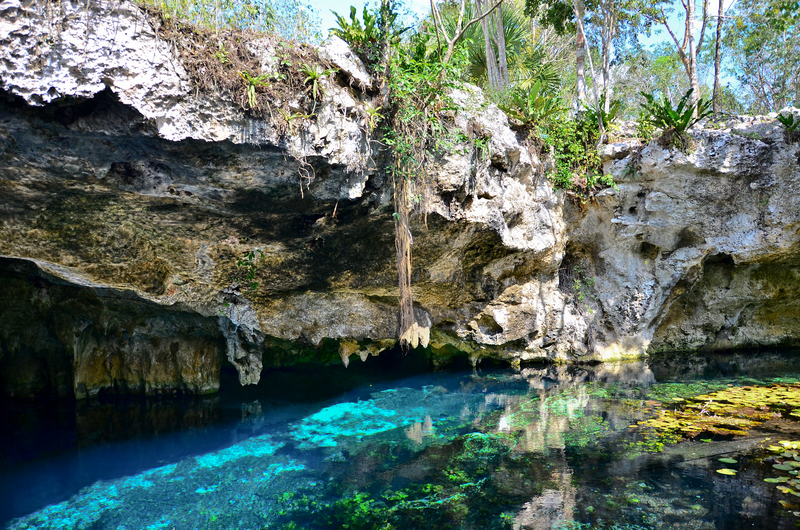 The Yucatan peninsula is the only place in the entire world, that you can find these absolutely magical bodies of water. Formed when an underwater cave collapses in on itself, these freshwater pools are a complete natural phenomenon. Divers and snorkelers travel from all over the world, for the chance to explore the amazing underwater rock formations, cave systems and marine life, found in these stunning cenotes. The Teotihuacan Pyramids. Photo credit: Shutterstock. 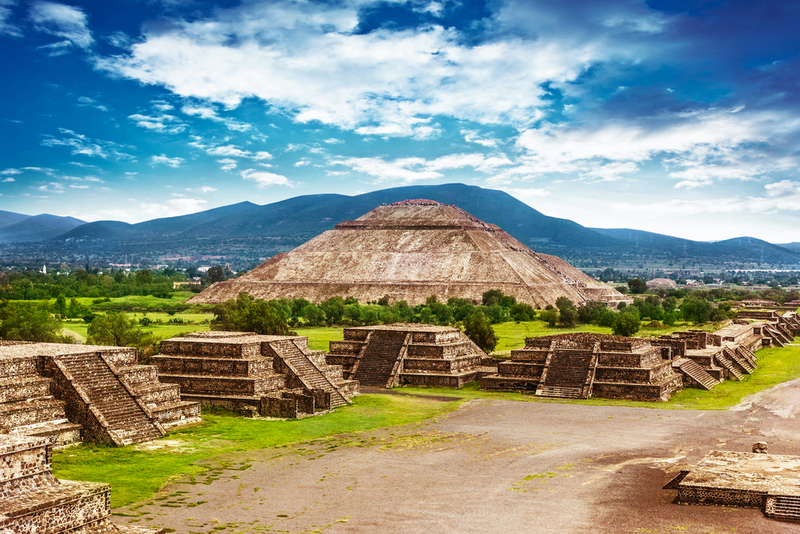 The Teotihuacan Pyramids are an archeological site, situated just north of Mexico city. This site is one of the most visited in Mexico not only for its amazing size, but also for the mystery shrouding its past. Little is known about the Teotihuacanos, or where they disappeared to, but they definitely knew how to build jaw dropping structures. The largest, and most central pyramid is the Pyramid of the Sun. It stands an impressive 66m high, and 220m wide. Due to its gigantic size, Mexico has extremely varying weather conditions. It will completely depend on which part of the country you will be visiting, and the time of year. The very north of Mexico, is the coolest area. The weather is heavily influenced by its neighbour USA, and temperatures can rest below freezing in winter, when the cold air blows in from Canada. In general, there isn’t much fluctuation in temperature in the north, it will get cooler and wetter as you reach areas of elevation, and a little warmer and dryer in the lowlands. 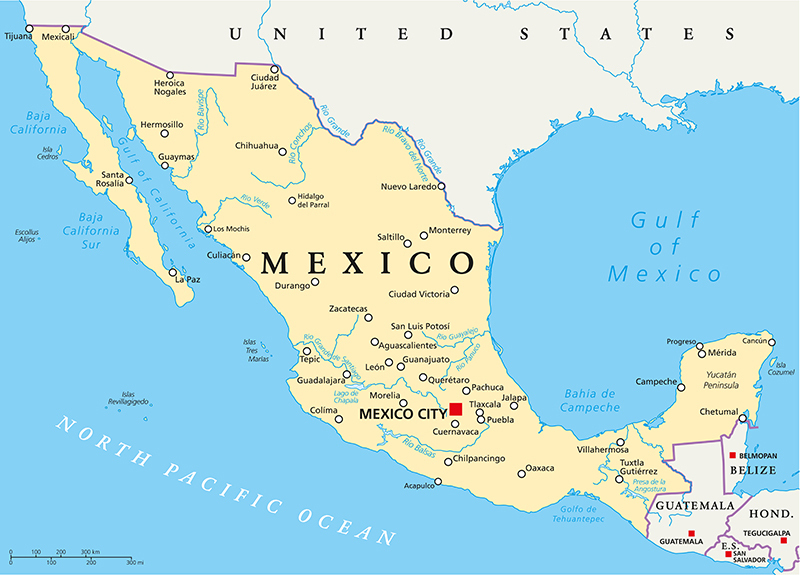 The centre of Mexico, particularly Mexico City, has a basic ‘Highland Climate”. There isn’t usually much fluctuation in weather for most of the year, with temperatures resting between 12°C and 16°C. However, during the winter months, temperatures have been known to dip below freezing, and in summer they can climb to a sweltering 30°C. Rainfall is found mostly at higher altitudes, but, as with most highland climates, rain can be expected sporadically throughout the year. The south of Mexico is where you will find most of its beaches, tropical jungle and extremely high humidity. Expect temperatures to stay around 20°C to 35°C all year round, and the sun to shine. The south of Mexico does experience a dry and wet season, with most of the rainfall and tropical storms landing between August and October. 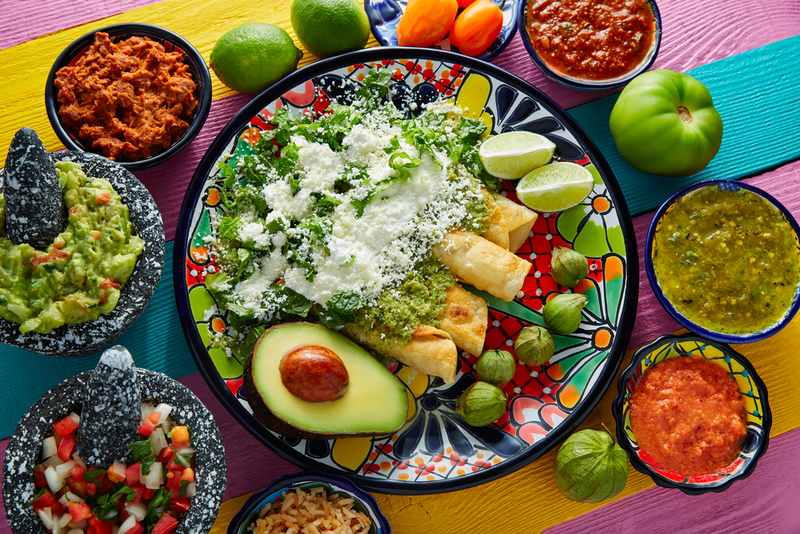 Mexican food is talked about all over the world. Many countries have taken some of the traditional techniques and ingredients, then put their own spin on it. But nothing compares to the real deal in Mexico. Mexicans pride themselves on their traditional, fulfilling and most of the time, natural cooking. From street carts, to family run, local kitchens, to fine dining experiences, Mexico has the best of them all. Tacos, enchiladas, guacamole, ceviche, chilaquiles, gorditas, tostadas…. and we’re just getting started! Mexico isn’t afraid to experiment and go completely full on with their flavours. This country’s food isn’t all about cheese, lime and chilli like some may expect. It’s an eclectic mix of fine flavours and ingredients, that you will be craving long after you leave. Especially if you’re planning on travelling outside of the main cities and resort areas. On the whole, Mexico has a great education system, but it is also a fairy poor country, and not everyone has access to it. 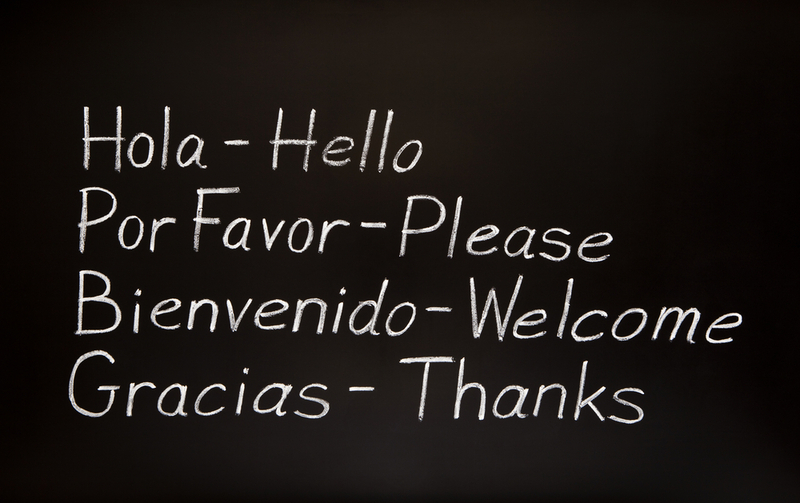 Help out the locals, and learn some basic phrases and words for your trip. Again, if you are traveling anywhere outside of the main resort areas, people won’t accept USD, or you will be grossly overcharged if they do. Bringing the local currency of any country you travel to is always a good idea. Female traveller drinks bottled water. Photo credit: Shutterstock. Like many countries in this world, it’s not safe to drink the water from the tap anywhere in Mexico. 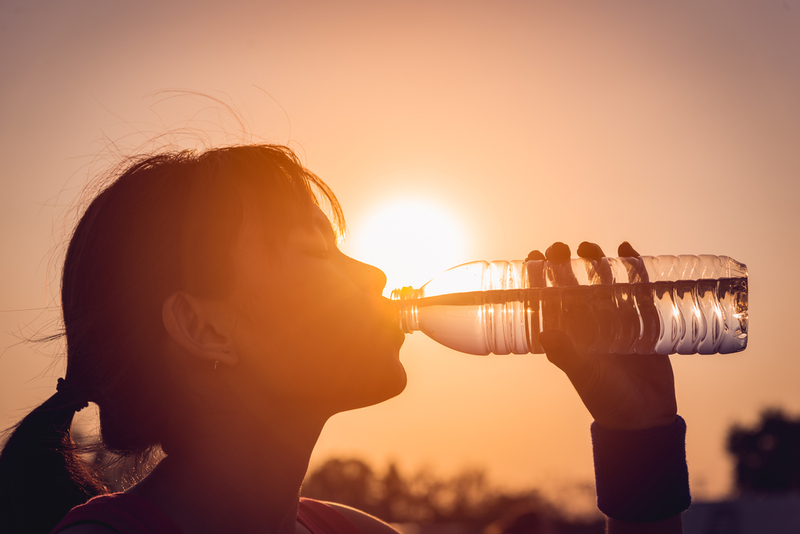 Use bottled water at all times, and try to avoid swallowing any while in the bath or shower too. Ok, no one wants to talk, or even think about this point, but it happens. Most travellers experience the ‘Mexican Stomach’ at some point in their trip through this amazing country. Whether it’s from the water, the food, or the weather, you should err on the side of caution, and bring something to settle your stomach. Thinking of trip to Mexico? Take a look at our tours of Mexico page and feel free to get in touch with one of our friendly Destination Specialists who are more than happy to help you design your dream trip to Mexico.